I’m starting a series of quick posts that cover easy modifications you should consider when eating. Today’s is one of the simplest. Choose the right butter! 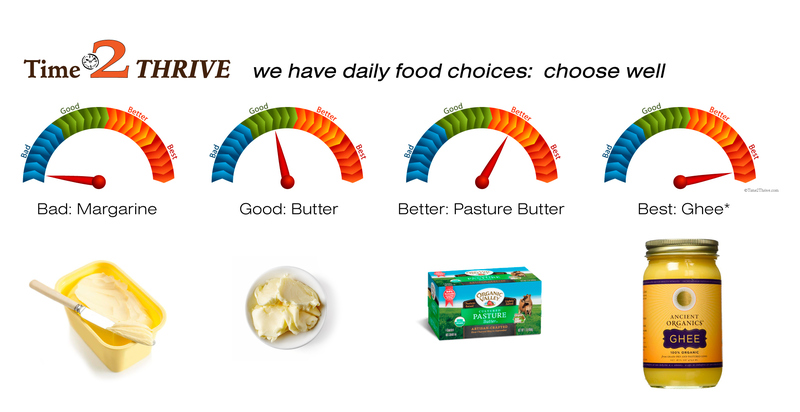 Want more information on WHY you shouldn’t eat butter or margarine, only pasture butter or ghee? Check out my update on fats: http://time2thrive.com/2017/11/16/update-on-fats-2017/ It also explains that there are many other good fats, see my posts about fats to see if your choices are among them. *Pasture butter is good for spreading, but ghee is clarified butter, so best for frying, sauteing and high heat applications.